One of the most distinctive voices of rock’s golden era, John Fogerty almost singlehandedly created a large chunk of what younger generations call classic rock and older ones consider the soundtrack of their lives. The songwriter and lead singer/guitarist of Creedence Clearwater Revival rose to fame by combining southern blues, soul, country, folk and rockabilly influences, and some Little Richard, with Louisiana swamp pop and fanciful bayou imagery. Eschewing the psychedelia dominating his San Francisco-area birthplace for tight, hook-heavy tunes that evoked simpler times (“Born on the Bayou,” “Green River,” “Down on the Corner”) or even carefree whimsy (“Lookin’ Out My Back Door”), he also spoke for a generation rebelling against fighting a fruitless war (“Bad Moon Rising,” “Fortunate Son,” “Someday Never Comes”). Between 1968 and 1972, CCR released seven albums; five made the top 10. Green River (1969) and Cosmo’s Factory (1970) hit No. 1; six of the band’s nine No. 2 singles came from the latter album alone. Remarkably, no CCR song ever reached No. 1, but 15 became top 20 hits and 13 earned top-10 status. Today, it’s hard to imagine a wedding without “Proud Mary” or a film set in the ‘60s or ‘70s without Fogerty on the soundtrack. It’s equally hard to imagine baseball games without 1985’s “Centerfield,” the title song of his first No. 1 solo album, though it was 1997’s Blue Moon Swamp that earned Fogerty his first Grammy, for Best Rock Album. Despite such accolades, plus CCR’s induction into the Rock and Roll Hall of Fame and Fogerty’s own induction into the Songwriters and National Baseball halls of fame (the only musician so honored by the latter), Fogerty, 67, says he doesn’t regard himself as a legend. 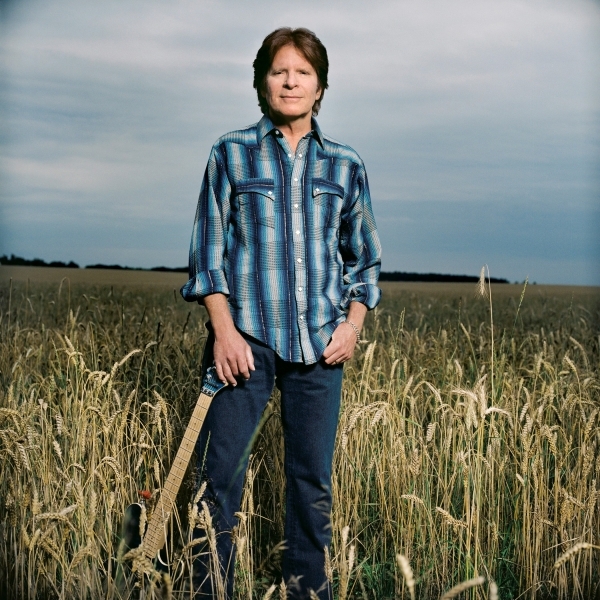 In November, Fogerty announced his long-awaited autobiography will appear in 2014. No doubt he’ll discuss such traumas as the band’s schism and breakup, losing his song rights, being sued for self-plagiarism and the enduring ache of losing his then-estranged brother/bandmate Tom to transfusion-induced AIDS. He remains estranged from his two surviving Creedence bandmates, but credits his wife and children with helping him overcome his anger and hurt. He touched on these subjects and many others in a lengthy, wide-ranging interview. Here is the expanded transcript of that interview, the cover story for our January Legends issue. This is a cover story for American Songwriter magazine’s “Legends” issue, and we were waiting for you so we can talk about the new album you’re doing and your history as a legendary artist. Thank you, that’s very flattering. It’s something I think about all the time — songwriting that is — but I don’t get to talk about it a lot, I guess. I haven’t been in the right pathway or something. Well, part of it probably was because I was away from the mainstream. You probably know the funny career tangents I’ve been on. Since the middle ‘90s I’ve been back in the fold, you might say, with an active career. There was a lot of showbiz stuff that went wrong. Someday, I’ll probably write a book about that. But I’m on a very positive trajectory these days, mostly because of my beautiful wife, Julie. So, y’know, I find that there are great gaps in the public’s awareness of me. Some of that might be because you took steps away from the business — intentionally or because of litigation. How come you haven’t written a book? Let’s talk about the new album. Why now? What’s the motivation? Really, most of these sort of things come from talking with my wife, Julie. She had this idea and presented the idea to me. After the idea was — after I kind of went “wow, that sounds like a great idea,” then we became a team. But I think she really came up with the idea first. It was because of how she said it. She said, “I think it would be a great thing, John, for you to do an album of your songs and have some of your favorite artists join you and do them.” That sentence really fired my imagination. I said, “You mean I get to make records with some of my favorite people?” And she said, “Yeah!” So I said, “Wow! OK.” [Laughs] That was very inspiring to me, and exciting, just as an idea. It wasn’t in some manager’s office deep in a skyscraper in a big city, you know, [how] someone concocts a career move for an artist. This didn’t smack of that at all. It was kind of self-indulgent. “You mean I get to record with some of my favorite artists? Yeah, I’ll do that. That sounds fun.” So here we are. How did you choose who you’d duet with? And which songs you’d do with those artists? It really evolved very organically. We started reaching out to people. I think my wife and I had been talking about this thing for several months, if not longer than that, a year or more. At one point I did something at the ACMs in Las Vegas, the country music awards. I think I was doin’ “Travelin’ Band.” They chose to open that particular show with a bunch of people doing “Travelin’ Band.” And two of the people involved were two of my favorite artists, Miranda Lambert and Brad Paisley. They were both people I’d been secretly admiring, and here we were, singin’ my song, and there they were. I was in the same room with these folks. In a purely selfish way, that was a big kick to me. I believe the next night (or maybe the next year), there was this thing called Girls Night Out, in which the producers were honoring a bunch of famous female country artists and having someone else sing with them. My wife chose that moment to ask a bunch of these people. We just prepared a letter, and we asked a bunch of those folks that were on my own list of people I really loved, like Brad Paisley and Miranda Lambert and Zac Brown, Keith Urban … a lot of them said yes immediately. So there was a whole bunch of people right away saying, “Wow, John, yeah, we’ll do one of your songs.” I encouraged each of these artists to come up with their own vision of my song, rather than just redoing what I’d recorded in the past. I was hoping they’d have some sort of different twist on it so it would be fresh. So I’d have to work too [and] it wasn’t just like, “Oh yeah, I know that arrangement ‘cause that’s the arrangement I’d made already.” I wanted it to be something new. That was my feedback to the artists. How many artists wanted in? Did you wind up with too many? I think I was thinking in terms of eight or nine people. The very first track that we recorded was with Miranda and that was almost a year ago. I’ve been recording and being with the artists in the studio. I really wanted it to be that way. I’ve heard that other people do this —they almost do it by text or email — but I sure didn’t want to do that. That sounds really distant to me. I thought it was really important for me and the artists to be in the same place, talking about what we’re gonna do ahead of time, seeing what they have in mind, and certainly by the time we’re ready to record, I wanted to be in the same place. And that meant either they came here to L.A., where I am, or I went there to where they were. So, to answer your question about how it grew, there probably was some general, finite number that somebody was thinking without me knowing, but it kept growing over time. Because you go in and record with someone like Miranda, and when you start to work on that, then somebody else agrees and comes into the picture, so then you have to go off and think about that. By the way, I’m the producer of the album, too, rather than me having some other person — which would have been OK, but this album is very personal to me. I’ve produced my own records from the beginning, so it wasn’t a scary idea, but it’s a more time-consuming prospect than I ever imagined, because you’re there that day with that person and you know these people are very busy people. Like Miranda, Brad Paisley or the Foo Fighters, Bob Seger, to do some name-dropping here — I guess this is a time when you can do that [laughs] — but you realize that their time is very precious. You may have known about that person for a long time — many, many years — but you’ve only met once or twice for five minutes over all that time. So when you’re going to be together all day in the studio, even though that sounds luxurious, you know that when that day is over, they go back to their hectic cycle and I go back to mine, so I’d darned better have it pretty well together when we’re together for those hours in the studio. And then it’s up to somebody to take that and bring it to fruition. A lot of times when you’re in the studio, you’ve captured it, you’ve got it on tape — well, it’s really not on tape anymore unless you’re being really old-school, which some of these were — but it’s still not finished. Someone, and that usually means the producer, has to bring it across the finish line. And that’s a lot more time listening and perfecting. If you feel it needs some other instrument that wasn’t there that day, then you’ve got to do overdubs, all that sort of thing, and so I’ve really learned on this project like no other in my life. Being the producer meant I have lived with every one of these other artists and their schedule and their career, meaning I’ve been going with that person, that artist’s life, to some degree, and getting their portion of this thing finished. I’m not complaining, but it became much larger than I ever realized as far as time and commitment. It’s an amazing thing. I’m thrilled; it’s been a wonderful experience. I really have to state that. I’ve learned so much, including so many things I never could have imagined. Because I picked people I dearly love, artists whose music I love and whose records I’ve been buying, in some cases for a long time, it became a sort of self-indulgence on my part. I got to go into their world and have some of their artistry rub off on me. It’s been an amazing journey. I guess after you spend so much time in your own bubble, to open up to other people’s styles and working techniques, that would be eye-opening. And how did you select which songs? Did you let them pick or guide them toward certain ones? I heard a lot of James Burton influence. Is that you or Brad? You’re absolutely right, James Burton was a huge influence on me going back to when I was a child, when I bought that record, “Suzie-Q” [Dale Hawkins’ 1957 hit] and that was James Burton playing that guitar — which I didn’t know at the time, of course. When he joined Ricky Nelson’s band and was coming into our living rooms every week, I knew who that guy was, and his way of doing things had and still has an influence on me. If I wasn’t already leaning off into the sort of country direction — but I think I was anyway — James’ way of doing things with Rick and on other people’s records, it certainly put that stamp into my playing. There’s a lot of country talent on this album in general. What influence has country been on you, then or now? It’s been a huge influence on me. It was always part of my musical life, even as a very young child. I was in preschool, and still in diapers, when my mother gave me a record of Stephen Foster. She explained to me it was a little recording for kids. There was one song on one side and one song on the other side. I explain that because when you say it’s a kids’ record it might mean an album or it might mean three or four songs on each side or something. This was, I’m sure it was a little record that was probably like yellow or red or something. But it was amazing that my mother explained to me that Stephen Foster wrote these songs. One side was “Oh Susanna,” and the other side was “Camptown Races.” And I listened quite intently and learned — I mean, I was 3 years old, Lynne. Why my mother thought that was important, I have no idea, but It was an amazing piece of information, life-changing really, to know that. Of course, I came to the conclusion that that was Stephen Foster on the record. [Laughs] I didn’t know yet that that would have been impossible. I grew up living right behind the graveyard where he’s buried in Pittsburgh. Oh, amazing! Well then you know that Stephen Foster, like myself, was not from the South, and yet he’s so heavily identified with the South. And he wrote many, many wonderful songs that are very southern in their point of view, very much like me, and yet, when he wrote a lot of them, he’d never been to the South yet. I’ve only learned this information in the last 10 years or so. I did not know that about Stephen Foster when I was a little, nor during my career with Creedence, doing songs like “Proud Mary” and “Bad Moon Rising” and “Green River,” which were so southern in their story-telling and their imagery. I knew I had a great debt, a great learning thing from Stephen Foster, but I didn’t know much about him. And the other thing I didn’t know: He was America’s first songwriter, the first guy who was actually writing songs and earning a living from being a songwriter. He was the first professional songwriter. So therefore, he was also, like me, the first guy who had his songs stolen, and the royalties from those songs probably doled out at a much lesser amount than they should have been. Oh yeah — he died penniless. Actually, drunk and penniless. And I’m hoping both those things aren’t what happens to me. Yeah, he died very early. Certainly, he was ill-used in all of this. But … my mom pointed that out; I don’t know why. I don’t think I heard anything like that again till I was 8 or 10, when I started hearing about Hoagy Carmichael and Irving Berlin and folks like that from the era now called the Great American Songbook. Anyway, you asked about country, and Stephen Foster, to me, sort of goes down that road. So did they do the big migration to California, like everybody else? Exactly, they came to California in the ‘30s. They settled in El Cerrito, which is where I was born. El Cerrito is right between Berkeley and Richmond. That’s basically what made me. A lot of those who came in the Great Migration — all the Okies like in The Grapes of Wrath, coming from the Dustbowl, coming down in the ‘30s looking for the promised land in California — a lot of them settled in Richmond. There was a lot of work in Richmond, in the shipyards, the war effort, that sort of thing. They brought their music with them. Those people were listening to a lot of rural country blues and country music. I even grew up in a house where my mother referred to these people as Okies. I’m sure a lot of people nowadays wouldn’t even know what that meant. She was calling somebody a hillbilly. It was a bit demeaning, but not so much. My parents weren’t bigots at all; they were not biased. They certainly had no racial prejudices. They did not run around our house using the N word or any other sort of derogatory thing. But they would say the word Okie. I took that to mean country music, right? That’s Okie music. Whenever you heard fiddle or twang, or things like “San Antonio Rose,” which I loved and they loved, that’s just what they’d call it, but with no rancor. There was no looking down your nose at it. The other side of that same coin was Berkeley, the college. Both of my parents aspired intellectually. They read a lot; I think they both spent some time in college. I don’t know if they had their degrees. My mom eventually became a teacher; my dad read a lot and admired writers, people like Hemingway. He used to read poetry to us all the time. One of his favorites was Robert Service; the poem is about dangerous Dan McGrew and all about the Yukon [“The Shooting of Dan McGrew”]. My dad would read these things and bring them to life. It’s about guys in the Alaskan gold rush, with a lot of bravado and hyperbole and exaggeration. My dad would talk a lot about hoboing and the railroads and all that kind of stuff, and to a kid this was very exotic stuff. That’s interesting because Woody Guthrie was popular at the time, and he was popularizing the term Okie on the radio. And California really embraced it. She didn’t close the door, but she didn’t really support it. So therefore, I had what every other rock ‘n’ roll kid had — I got to like it even more because my parents didn’t like it. You know what I’m saying? Ha. Exactly. The whole point of being a kid was rebellion. Regardless of what kind of music it was. They’re still doin’ it. Right. That’s exactly right. So all of that, the James Dean corner of the world, made a whole lot of sense to me. Here’s a really funny one I think about sometimes. Because I live in several worlds, I have many genres of music that are my heritage, you might say. Sometimes the rock ‘n’ roll people, especially the ones that might be long of tooth, they might have grown up in the ‘50s and ‘60s, and rock ‘n’ roll got a bit respectful and more intelligent, because there’s been so many books and essays written. I’m talking about the kind of thing that would go on in New York City, where they might have a night of discussing rock ‘n’ roll and the Beatles and John Lennon and all of that, but there’d be nary a fiddle in sight. Somehow, country music is actually even more rebellious than rock ‘n’ roll. It’s just that some of the rock ‘n’ roll crowd doesn’t know that. That’s quite true. It is a lot more about cheating and killing and all that stuff. Right. And you will get a lot of the rock ‘n’ roll crowd to look at you like my mother looked at me when I was loving Elvis Presley. Country is one more step removed as far as being politically correct. That didn’t occur to me until I was a grownup. Probably in the last five years. A of of my friends that really love rock — you know, we grew up with classic rock —they’re not invitin’ Hank Williams to the party like I would. Hank Williams was as rock ‘n’ roll as you could ever get, as far as I’m concerned. Yeah, they definitely were the outlaws.